Dietary fibre can regulate body and cell function. Dietary fibre is the substrate that determines symbiosis and symbiotic evolution. The endosymbiotic archaea regulates human functions and species type and depends upon the colonic archaea whose density is determined by the fibre intake. Populations with low fibre intake have lesser density of colonic archaeal microflora and endosymbiotic archaea. Endosymbiotic archaea contributes to neanderthalisation of the species. Populations consuming a high saturated fat and protein diet with low fibre intake tend to get increased endosymbiotic archaeal growth and are neanderthalised. Populations with high fibre intake up to 80 g/day tend to have reduced archaeal density in the colon and reduced archaeal endosymbiosis contributing to homo sapienisation of the population. 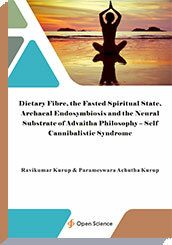 Dietary fibre is the substrate for symbiotic evolution and human species evolution- spiritual and cultural evolution. Dietary fibre deficiency and states of fasting related increased colonic archaeal growth and brain endosymbiotic archaeal growth. This can lead on to brain quantal perception and a trance-like spiritual state.